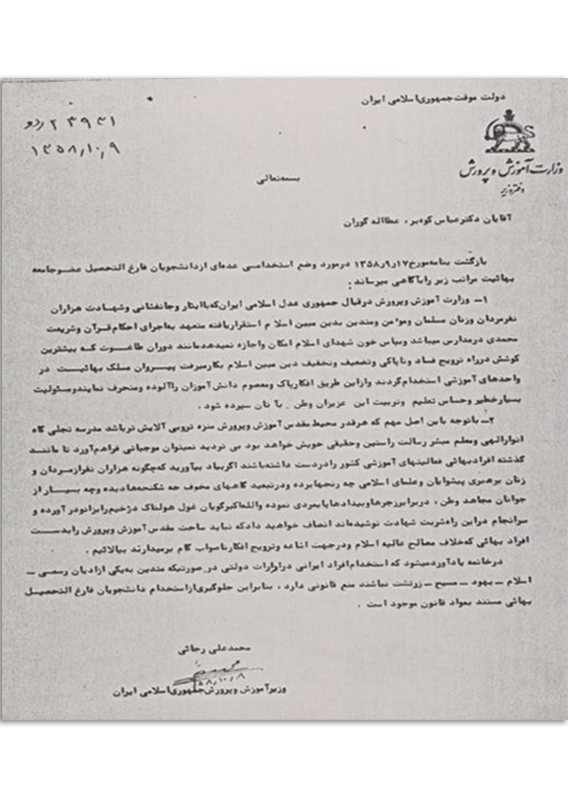 According to this document signed by the Minister of Education of Islamic Republic of Iran, Mohammad Ali Rejai, the graduate students who are members of the Baha’i community are denied employment in the schools and educational units due to their religious beliefs. 1-The Ministry of Education is committed, before the Just Islamic Republic of Iran which has been established through the sacrifice and loss of lives and martyrdom of thousands of Muslim men and women, to implement the ordinances of the Koran and the Muhammadan Shari‘a laws in schools. In order to show reverence to the blood of Islam’s martyrs, the followers of the Baha’i sect are no longer permitted to gain employment in the educational units which would defile and corrupt the pure and innocent minds of the students and will not be entrusted with the serious and sensitive responsibility of training and education of these loved ones of the country. 2- Owing to the importance of this principle that, the cleaner and the less tainted is the sacred environment of education the more it manifests the divine light and the more a teacher can bring the glad tidings of his true and rightful mission. Undoubtedly such circumstances cannot be allowed to exist whereby Bahá’í individuals control the educational activities of the country, as they did before. If you only recall how thousands of men and women, under the leadership of the Muslim clergy and leaders, suffered so much pain and torture in horrible prisons, and so many Mojahed youth of the country withstood the torture and cruelties and how they, with one call of Allah’u’Akbar, brought the terrible and dreadful monster to his knees and finally drank from the cup of martyrdom, you would justly realize that the sacred threshold of education should not be defiled by the Baha’i individuals who walk against the exalted interest of Islam and take steps to propagate and spread unwholesome thoughts. In conclusion, I remind you that hiring Iranian individuals in government agencies, if they are not followers of one of the official religions – Islam, Judaism, Christianity, and Zoroastrianism – is against the law. Therefore, to prohibit employment of the Baha’i graduate students is in accordance with the existing law.